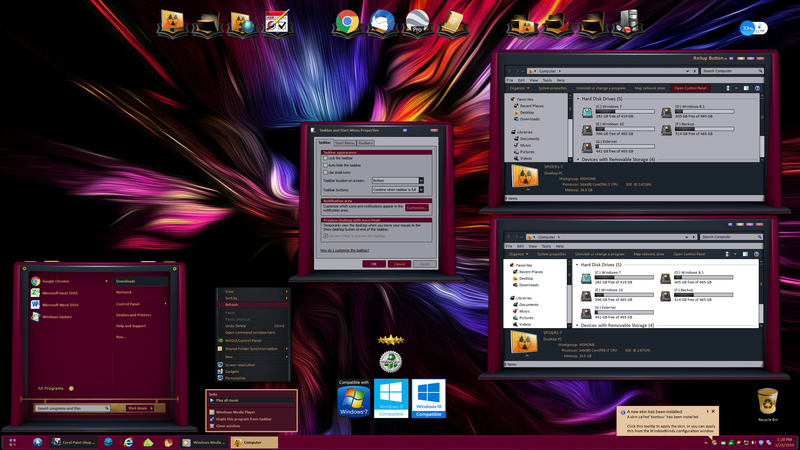 Welcome to Kontour, my latest Master Skin for Windows 7, 8 and 10 with dark and light explorer sub-styles. It is easy on the eyes and has some great 3D looks, yet maintains great functionality. A roll-up button has been integrated into the skin for those who use it, and many thanks again to RedneckDude for his valued assistance in the testing of this skin. The wallpaper shown is included with your download in 1920x1080 and 2560x1440 resolutions. I am sure you'll enjoy the look of Kontour on your desktop! Beautiful WB, Nice style Tom. 3D frames are so cool, Tom! Good skinning! Thanks much Andy and Jim! Wow, this is a real beauty Tom! Perfection! 10 out of 10! Absolutely AMAZING looking WB theme ...TOP NOTCH! If i could give it 477,000 stars.. I would! T A S T Y !!! Tom, although I like it very much (see my earlier reaction) I do notice that (possibly?) because of the original window-form of your skin, there is less space within the window, and in some applications this (and the window-form itself?) a bit peculiar effects now and then which I don't experience with other skins. Do others notice this as well? For example, the right side of the window is white until I move around the window a bit with the mouse, the same with the button section of the window (both occu only now and then), and various windows seem to have spontaneously different sizes than earlier (although I can change this with resizing these windows of course), and the layout of the explorer-parts of certain windows is jut a bit off (f.e. with total commander, which I use a lot). All are certainly not major issues, please consider it as feedback only. Yeah, blame that on Microsoft Arnoud, all those areas are perfect in Windows 7, and they really screwed things up in Windows 8 and 10. Try this, close all open windows and in WB go into Settings and check Do not use per pixel frames even if the style supplies them. Reapply the skin and all frames will convert to the UIS2 frames, which should fix those problems. Sometimes creative vision needs to surpass and overide technical drawbacks..
For the SAKE OF SUBLIME DESIGN!!!! Tom, although I like it very much (see my earlier reaction) I do notice that (possibly?) because of the original window-form of your skin, there is less space within the window, and in some applications this (and the window-form itself?) a bit peculiar effects now and then which I don't experience with other skins. Do others notice this as well? For example, the right side of the window is white until I move around the window a bit with the mouse, the same with the button section of the window (both occu only now and then), and various windows seem to have spontaneously different sizes than earlier (although I can change this with resizing these windows of course), and the layout of the explorer-parts of certain windows is jut a bit off (f.e. with total commander, which I use a lot). All are certainly not major issues, please consider it as feedback only. Keep up the good work! Thanks, Arnoud Yeah, blame that on Microsoft Arnoud, all those areas are perfect in Windows 7, and they really screwed things up in Windows 8 and 10. Try this, close all open windows and in WB go into Settings and check Do not use per pixel frames even if the style supplies them. Reapply the skin and all frames will convert to the UIS2 frames, which should fix those problems. Let me know how that works out for you. If we catered to every app and every window that WB skins, there would be no point in skinning IMO Sometimes creative vision needs to surpass and overide technical drawbacks.. For the SAKE OF SUBLIME DESIGN!!!! I understand what you are saying. I just thought it might be useful feedback, that's all. Very beautiful skin! Bravo Tom!!! If we catered to every app and every window that WB skins, there would be no point in skinning IMO Sometimes creative vision needs to surpass and overide technical drawbacks.. For the SAKE OF SUBLIME DESIGN!!!! I understand what you are saying. I just thought it might be useful feedback, that's all. Indeed ! No problem at all Arnio!